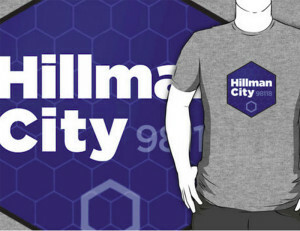 DRESS CODE ALERT: The Hillman City hexagon/beehive logo is now something you can wear. Order your 100% cotton shirts–you choose the color–here. Hoodies and other gear also available. Blue beehive logo by HC-based design group Universal Declaration.